Dedicated to all Indians who are silent victims of India's gender biased laws. Why are women arrested in India? As per NCRB, in 2011 about 19,3555 women got arrested in India. Can you guess the top 6 contending crimes for these so called female suspects? Ofcourse, what else could have been the favorite pastime for mother-in-laws and sister-in-laws, other than taking care of their own families ? 498A seems to be the easiest way to settle scores with there husbands....implicate the weaker....his mother, sisters, aunts, grannys, etc etc etc. Strangely, never was she slapped or even scolded by ANY of her own mother or a female relative. Anyway, keeping sentiments aside, NCRB even provides an age wise breakup as well. While 498A had 41298 women arrested, ‘Hurt’ having 14 separate IPC sections, is second with 36063 women arrested. Check out how graph for this age group is different w.r.t other IPC crime arrests. While others take a dip, 498A bulges out. Obviously, for argument sake we can say that these are the mothers, aunts, etc and the nature of crime is such that this group is going to have a high number. But, how come its possible, ONLY after a mother (of ONLY a married son) attains this age, her chances of committing such a grievous crime and thereby arrested suddenly increases many folds? The graph clearly suggests that IPC section 498A is grossly being misused and police is arresting women of this age group just for harassment and extortion. I call this the fatal zone,because when the grandmother (of a married grandson) is supposed to enjoy her last few days happily with her family members, one twist of fate can land this lady behind lockup/jail…courtesy our sati savitri bahu J Compared to other crimes under IPC, a 498A case for a senior citizen woman can turn fatal both mentally and physically. 1) PLEASE STOP TREATING & ARRESTING THE WOMEN-IN-LAWS AS CRIMINALS WITHOUT COMPLETING PROPER INVESTIGATION IN IPC 498A. 2) DO NOT DIFFERENTIATE BETWEEN THE MOTHER OF A SON AND A DAUGHTER. 3) ABOLISH 498A AND STOP THIS LEGAL EXTORTION RACKET. Misuse of DV/498A - A Myth or Reality ? Let me start by putting some statistics from NCRB (National Crimes Record Bureau, India). These data are readily available at http://ncrb.nic.in/ for reference. Here I have considered the top three crimes in terms of ‘% of Total IPC Crimes’ for the last five years and took an average of them, each individually. Now, for argument sake, lets consider that there were in total 100 total IPC crimes for each type of crime reported in India. And use the same rates as provided by NCRB to see things in perspective. Thus if we take average, here is what we get as summary (for every 100 crimes reported). Now if we put the above info in a graphical form an interesting fact is revealed. What does this graph suggests? 1) While the top IPC crimes like theft and burglary follow a very similar pattern, as far as DV/498a is concerned the graph is completely different. 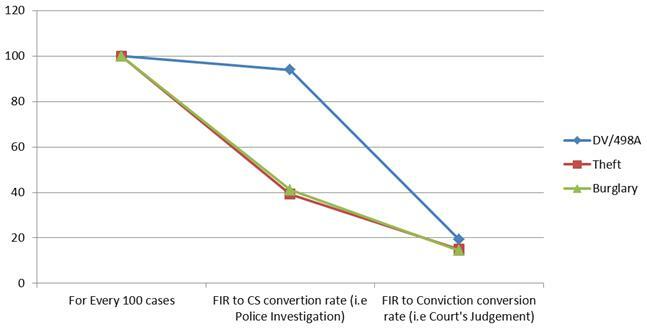 2) While for theft and burglary, post police investigation only 40% of FIRs are finally converted to a chargesheet, in DV/498A that percentage is close to 94%. DOES IT INDICATES THAT POLICE IS UNDER PRESSURE DURING DV/498A INVESTIGATION TO FILE A CHARGESHEET ? 3) While only 25% of theft/burglary cases are proven to be false in court, a whopping 74% of DV/498A cases are proven false in court. 4) Interestingly for all the three cases the conviction rate is more or less same, which proves that judiciary is not at fault and neither is the law per se. Had police been able to act effectively without any external pressure, the number of false cases registered could have been reduced and judiciary would have been spared from this huge number of cases which are currently getting piled up in Indian courts. 2) 498A/DV INVESTIGATION NEEDS TO ADHERE TO SOME STRINGENT PROCEDURES AND REGULATIONS. 3) STRICT PUNISHMENT FOR NOT INVESTIGATING 498A/DV CASE AS PER THE AMENDED PROVISIONS OF LAW.